“The Downey division pioneered advances in missile technology that became the cornerstone of America's rocket industry. The Downey plant produced the GAM-77 (AGM-28 Hound Dog Missile) Hound-Dog, an air-to-surface nuclear missile carried under the wings of B-52 bombers. The Downey U.S. Air Force Plant 16/North American Aviation, Inc., occupied the same Downey land that E.M. Smith had bought in the 1920’s to found an air field and aviation company, and which Vultee made great during the World War II years. The project, the Hound Dog Air-to-Ground Missile Program, was to aid the mighty U.S. fleet of B-52s hit targets while remaining at a relatively safe distance. It used much of the tracking technology already developed for the Navaho Missile. July 1957: Proposal for GAM-77 Hound Dog is submitted to Air Force. The contract was awarded North American in Oct 1958, two and a half years after the Strategic Air Command had realized its need. Above- GAM-77 Hound Dog Missile. Above- AGM-28A Hound Dog Missile. Above- Hound Dog missiles line the runway at North American Aviation Missile Division in Downey CA, 1959-1960. Facing southeast. 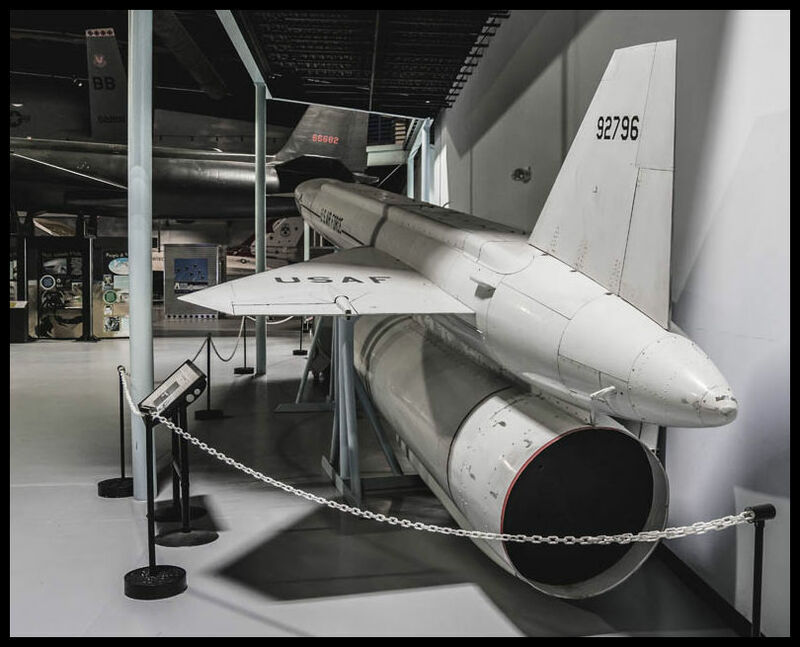 “The Hound Dog [the Air Force lifted the name from the title of an Elvis Presley hit song was designed as a long range, stand-off air-to-ground strategic missile. 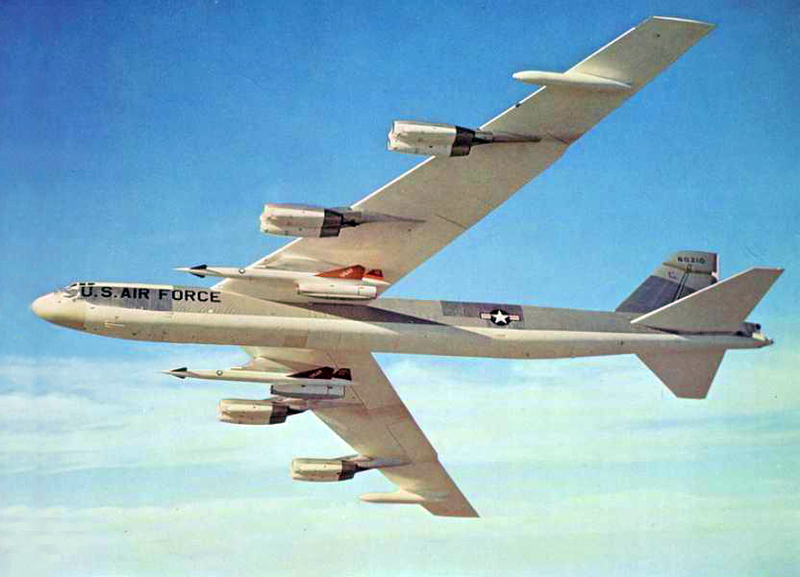 It was carried in pairs beneath the wings of B-52 aircraft. The overall mission of the Hound Dog was to aid B-52s in successfully carrying out the strategic bombing offensive. This would be accomplished by providing a means of attacking and destroying heavily defended enemy targets without subjecting the B-52 fleet to unacceptable loss levels, and by assisting bombers in penetrating enemy targets by attacking and destroying segments of the enemy's air defense system. The Hound Dog missile program began on 15 March 1956 when Headquarters Air Force issued a General Operations Requirement (GOR 148) for an air-to-surface missile to be carried on the B-52 strategic manned bomber. In August 1957, Secretary of the Air Force James H. Douglas telephoned J. H. Kindelberger of North American Aviation to tell him that his company had won the development contract. And on 16 October 1958, Headquarters USAF awarded a Hound Dog production contract to North American Aviation, Inc. In February 1958, growing concern about both the perceived unfavorable shift in the strategic balance and the increasing vulnerability of penetrating bombers prompted USAF to accelerate the Hound Dog. On 21 December 1959, General Thomas S. Power, Commander in Chief of the Strategic Air Command, formally accepted the first production model Hound Dog missiles in a ceremony conducted at North American Aviation's Downey, California plant. Headquarters Air Force finalized the Hound Dog missile program at the end of fiscal year 1959 when it approved a force of 29 B-52 squadrons equipped with Hound Dog missiles. The first launch of the missile from a B-52, first designated GAM-77, then AGM-28 Hound Dog Missile, took place in April 1959.